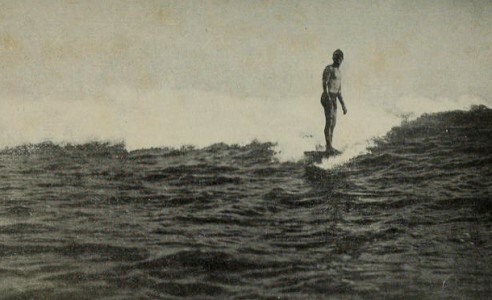 William R. Castle, Jr. : Surf riding in Hawai'i, 1917. Dodd, Mead and Company, New York, 1917. The Hawaiians were a sport-loving people. Boxing, wrestling, foot racing, and bowling with polished stone discs were among the favourite amusements. Still to be seen, also, are the long slides on steep hillsides, down which they darted on wooden sleds. It is this surf riding, as popular now with foreigners as with the natives, which makes Waikiki, near Honolulu, unique among bathing resorts. The surf rider takes a long, smooth, polished board and with it swims out a half-mile or so from the shore. He then lies flat on his board and swims rapidly toward shore until a roller catches the board and carries him on its crest to the beach. Expert surf riders can raise themselves to a standing position after the wave takes them and so ride, standing, for hundreds of yards, or as far as the wave will carry them. cause the swim out to sea, diving under the waves as one goes, has almost the fun of the ride back. For those who cannot swim the tamer sport of surf riding in long Hawaiian canoes, the outriggers of which make an upset next to impossible, is a good substitute. 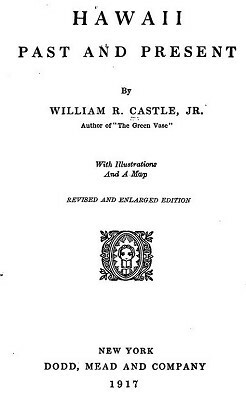 Geoff Cater (2013) : William R. Castle, Jr. : Surf Riding in Hawai'i, 1917.